Cool Apocalypse will make its International Premiere at the Lumiere 6th CinemAvvenire Film Festival in Rome, Italy in 2016. A tale of modern love in the vein of Richard Linklater and Eric Rohmer: the plot intertwines the stories of two very different relationships – one of which is about to begin and the other of which has just ended. The lives of the four principal characters, all recent college graduates in their early-to-mid-20s, intersect over a period of 24 hours. Through the interactions of these creative and soulful young people — an aspiring novelist, a feminist blogger and a pair of video journalists — viewers become privy to provocative and playful insights into how men and women relate to each other at different stages of a relationship. 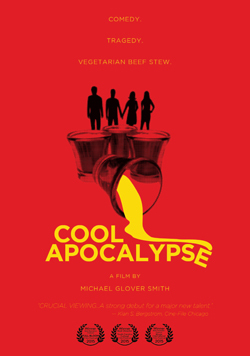 My goal in making Cool Apocalypse was to tell a simple story about people and relationships. I specifically wanted to collaborate more closely with actors than I ever had before — and I’m very proud of my lead performers, Nina, Chelsea, Adam and Kevin, for working so hard at mining each and every scene for psychological and emotional truth. I hope that everyone who sees the end result finds it relatable on a human scale. I also wanted to make a true “Chicago movie” — one that captures the unique rhythms of life in my hometown, by showing how some of its inhabitants live, work and play over the course of a single day.